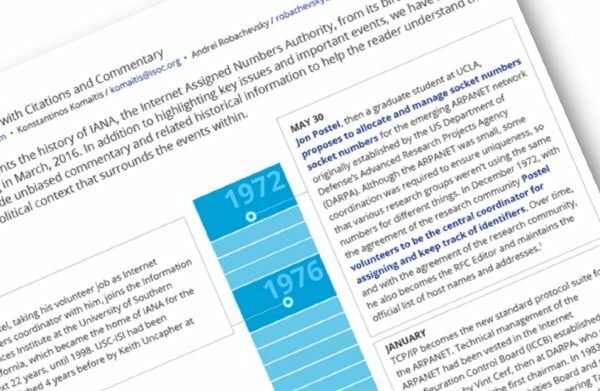 Since the historic announcement by the National Telecommunication and Information Administration (NTIA) in March 2014 of its intent to withdraw its stewardship role over the IANA functions, the Internet Society and its members has been active participants in the process to develop the transition plan. 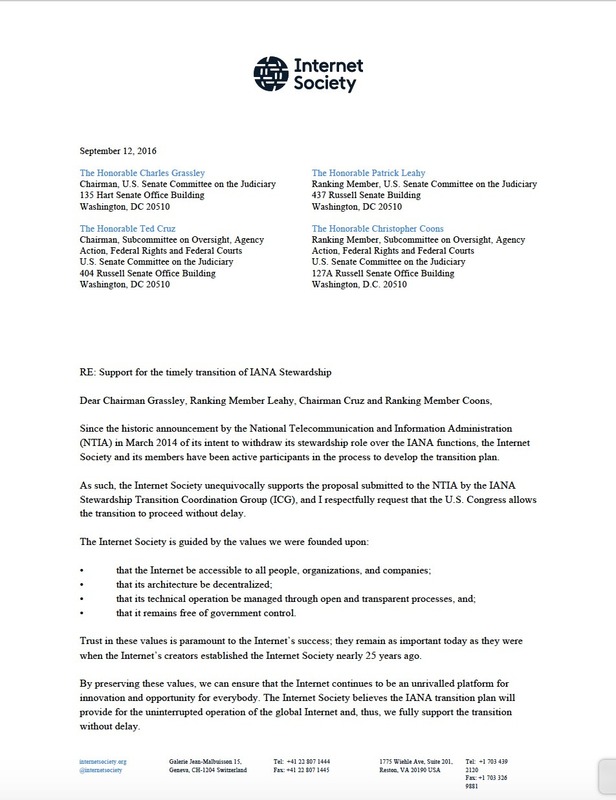 As such, the Internet Society unequivocally supports the proposal submitted to the NTIA by the IANA Stewardship Transition Coordination Group (ICG), and I respectfully request that the U.S. Congress allows the transition to proceed without delay. that it remains free of government control. Trust in these values is paramount to the Internet’s success; they remain as important today as they were when the Internet’s creators established the Internet Society nearly 25 years ago. By preserving these values, we can ensure that the Internet continues to be an unrivalled platform for innovation and opportunity for everybody. The Internet Society believes the IANA transition plan will provide for the uninterrupted operation of the global Internet and, thus, we fully support the transition without delay. It is crucial to understand what the IANA functions are, and equally important to understand what they are not. The IANA functions are, by design and by function, invisible to the average Internet user. They are very technical in nature, and relate to the Internet’s naming and numbering system. They form a part of “how the Internet works”, and not “how the Internet is used”. In fact, the scope of these functions is very narrow – the IANA functions should not be equated with the Internet as a whole. Legitimate public policy issues like net neutrality, censorship, and human rights are being addressed elsewhere, and are not part of this discussion. While the positive impact the Internet has had on the economy and well-being of the 3.5 billion people who use it is practically unrivalled in human history, it has existed – and succeeded – without government regulation or excessive intervention from its beginnings. This will not change after the transition. In fact, the relative power held by governments within ICANN will actually decrease as the role of the private sector, civil society, the technical and security communities, and end users will be enhanced. Governments will be but one stakeholder among many, with no more or no less power than any of their counterparts. Within the new oversight structure, the interests of the United States with regard to the technical operation of the key Internet domain name functions will be represented through participation in the Governmental Advisory Committee (GAC) of ICANN. And, numerous U.S.-based private sector entities, non-governmental institutions and groups representing end users will continue to actively advocate for their interests within ICANN. transition the oversight of these technical Internet functions began when ICANN was created in 1998. That bipartisan intent continued over nearly 20 years and through numerous administrations in Washington until the U.S. Government (and the global Internet community) decided it was time to complete the transition. The Internet Society sees no reason to delay or to block the transition now. In fact, any delay would add a degree of instability and make the prospect of government control of the Internet more likely, not less. It would be a signal to those countries that have been advocating for an enhanced role for governments in the management of the Internet that the U.S. Government does not believe that this technology works as designed, and that the multistakeholder model of Internet governance that the U.S. has supported and promoted for decades has failed. Moreover, a delay or derailment of the transition plan creates the real risk of detrimental consequences in the future from the creation of parallel DNS systems and splinter networks that would fragment the Internet, weakening its ability to operate and further detracting from its global nature. In our expert capacity, based on years of global experience in the Internet ecosystem, we are confident that the time for the transition is now and that the safeguards, processes, and mechanisms put forward in the IANA transition plan provide the right way to do it. The interests of all stakeholders, including the United States, will continue to be well-represented post-transition, and there is global consensus that completing this process is a positive step forward in the ongoing development of the open Internet. Blocking or delaying the transition at this point will have negative implications for the Internet and the millions of Americans who rely on it every day. The Internet Society urges you to ensure that there be no delay in the completion of this important work.